Love to Drink Lemon Juice !!! Ask most people how they feel about lemons and they will either pucker their lips or insist that the yellow fruit’s only place is in lemonade. Yet little do many know, lemons are some of the most nutrient-rich and healthy fruits out there that can be used to ease a wide variety of ailments. Here is a list of a few ways that lemon juice can transform your bodily health, for the short-term and the long-term! Lemons are rich in vitamin C, B, calcium, iron, magnesium, potassium and fiber. Although vitamin C is the key to jump-starting our immune system, the rest of the nutritional benefits of the lemon can certainly do you no harm. It’s good to drink a glass or two of lemon water when you are feeling stressed, because that is when your immune system is most likely to fall weak to any surrounding bacteria or viruses. Potassium is good for your heart health as well as your brain and nerve function. It is usually found in vegetables like potatoes and spinach, but lemons are also an excellent source for a potassium boost. Lemon water should be drunk at room temperature as warm water helps stimulate smooth movement within the gastrointestinal tract. Lemons and other citrus fruits contribute to this effect because they are high in vitamins and minerals that loosen up the toxins in the digestive tract, known as ama. Lemon is an excellent natural remedy for symptoms of indigestion like heartburn and bloating. Lemons increase the rate of urination and therefore are able to quickly remove toxins in the digestive tract that can affect the health of the urinary tract. The potent vitamin C in lemons helps keep the skin blemish and wrinkle-free. In addition the antioxidants in lemon juice can be applied to scars and age spots in order to reduce their appearance without diminishing the skin’s radiance. Drinking lemon water on a regular basis may decrease the levels of acidity within the body, which is where disease is most likely to occur. It works to remove uric acid in the joints which is the main source for joint pain and inflammation. It’s best to drink the lemon water in the winter at a lukewarm temperature to fight off the effects of cold-weather stiffness. 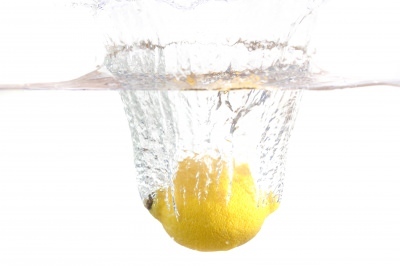 Lemon juice is an excellent way to cut back on caffeine in coffee or soda because it has similar rejuvenating effects. Substituting your morning cup of joe for a cup of hot water and lemon may save you from an afternoon crash and quiet your caffeine cravings. Starting your day off with a cup of hot lemon water can not only prevent fatigue later on in the day, but also dehydration. Dehydration is one of the major causes of toxic buildup, stress and even susceptibility to viral infections. So if you are the kind that forgets to drink water, it is recommended that you drink lemon water in order to stay hydrated throughout the day.